Sorry about not posting last week—I had an unusually bad headache. 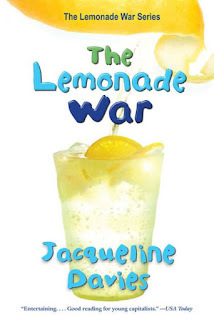 Luckily, this week, I have a recommendation for The Lemonade War by Jacqueline Davies. Despite what the publisher's description says, this book is not excessively or glaringly educational and will be enjoyed by anyone of any age, from young children to MG readers to adults. Evan and Jessie are great characters with different personalities, and readers will be able to empathize with their conflict (involving both of them being in the same class, as Jessie is skipping a grade). 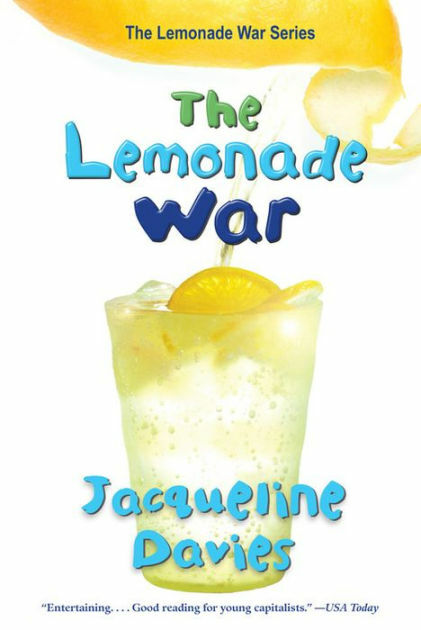 Both Evan and Jessie's tactics to win their “war” (a competition involving profit from their lemonade stands) are interesting to read about (and, yes, educational to very young readers). As both characters make friends and money, accidentally upset each other, and feel guilt, stress, and more, readers will want to know what happens next. Best of all, when readers finish this book, they can read the four additional sequels! All in all, The Lemonade War is a great read for young kids, old kids, and adults alike! 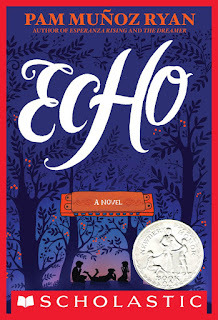 For MMGM, I am recommending Echo by Pam Muñoz Ryan. This Newbery Honor Book is incredible! One of the best things about it is the vivid portrait of the time and its hardships that it paints. The book is intertwined with subjects such as the Nazis, Japanese internment camps, orphanages, and fighting in the war. Every issue that occurs in the book, from Friedrich being pressured to take part in a Nazi-required surgery to prevent him from having kids due to a large birthmark on his face, to Mike discovering that his new adoptive mother plans to give him and his brother up, to Ivy dealing with having a sibling fighting in the war while visiting the home of a family currently in a Japanese internment camp, is handled deftly and touchingly. Every character is complex, even minor ones, and readers will root for the three major ones until the end of the book, which features an uplifting ending. The book's nearly-600 pages are not filled with text and go by quickly, making Echo one of the rare books that can teach about the past, emotionally impact its readers, and move quickly and be enjoyable to read! I've finally gotten around to choosing the two winners of my giveaway of The Castle in the Mist by Amy Ephron, and here they are! The winners are . . .
Congratulations! If you are one of the above winners, check your email (including spam or junk folders) and reply to my email with a mailing address within 48 hours. Thanks to all who have entered in my giveaway (I noticed some new entrants as well as some familiar ones), and be on the lookout for my upcoming holiday giveaway, which will feature several signed MG and YA books! As you may have noticed, I have taken an unusual amount of breaks from blogging recently. I decided that, this week, I needed to post a review. However, this week, I (of course) got sick, so I apologize in advance if this review is a mess! Before my recommendation (which is for Fly Away by Patricia MacLachlan, author of the famous novel Sarah, Plain and Tall), however, I would like to remind my readers that my giveaway of two signed copies of The Castle in the Mist by Amy Ephron closes this Tuesday, so be sure to enter here if you haven't already. Fly Away is a short book with large font (aimed at younger readers), but it still packs in much meaning and emotion. Every character is distinct and rich, from Lucy, who is upset that she is a bad singer and wants to write poems, and Gracie and Teddy, Lucy's younger siblings with their own personalities and development, to the adults in the story, such as the siblings' Aunt Frankie. The setting of Aunt Frankie's house is vivid and well-described, and, although Fly Away may seem simple at first, every moment is touching and vital to the story. From moments where we learn more about a character or how s/he has changed to simple events of everyday life, every part of this book is incredible. 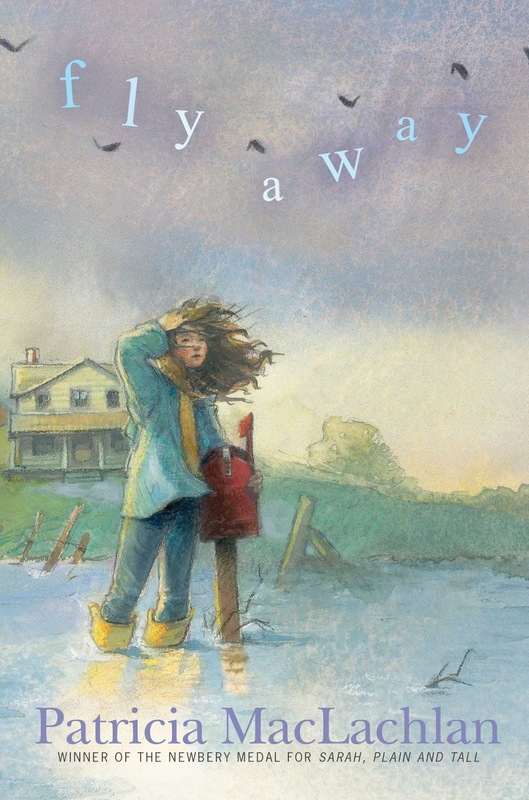 Although my mind refuses to think of anything more to say, Fly Away is an amazing book that everyone will come out of with hope and positive thoughts.